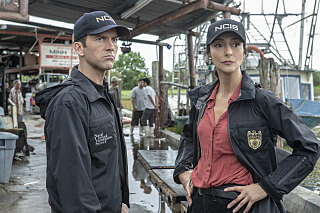 NCIS: New Orleans 5.04 - "Legacy"
investigation into his family’s company. already wondered when we will hear again about the company. glad lasalle's father wasn't as bad as it seemed at first. thought eddie was the bad guy when he appeared at HQ and asked about the girls, but then i watched him with his parents and thought it was someone else who killed trang's nephew. I am glad that LaSalle's father was actually good and not bad. It was nice what he did for his employees. I am really liking Hannah. Can't believe the guy killed his own cousin (I think he was?). That one I did not guess. Gregorio: Do you have any idea how weird you are?